Why should I get my roof coated with a reflective coating? Coating will extend the life of the roof, by reducing heat transfer into the building, decreasing thermal shock (thermal expansion and contraction of the roof membrane), and helping to mitigate leaks. Reflective coatings also can reduce heat energy costs and improve the aesthetics of the roof. What kind of roofs can be coated? 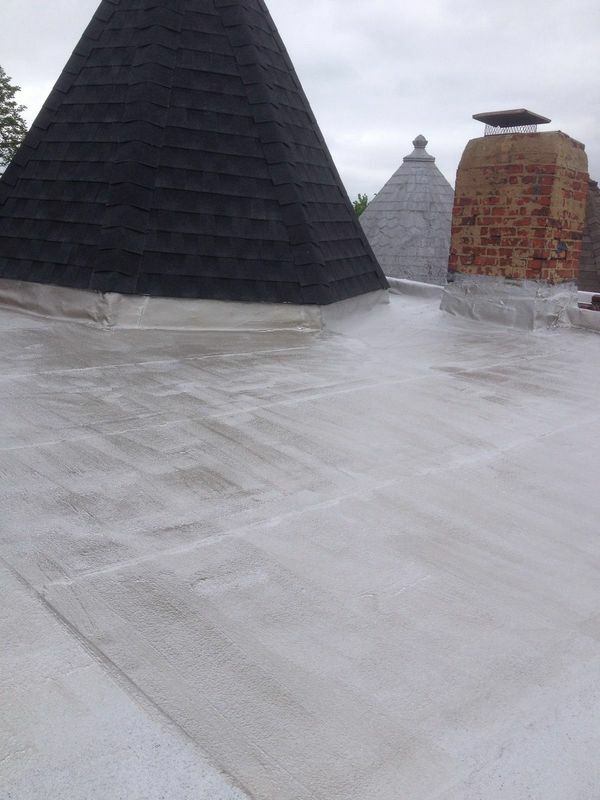 Almost all types of roofs can be coated. Some examples include metal, spray polyurethane, single-ply, modified bitumen, Built-up roof (BUR) systems, etc. 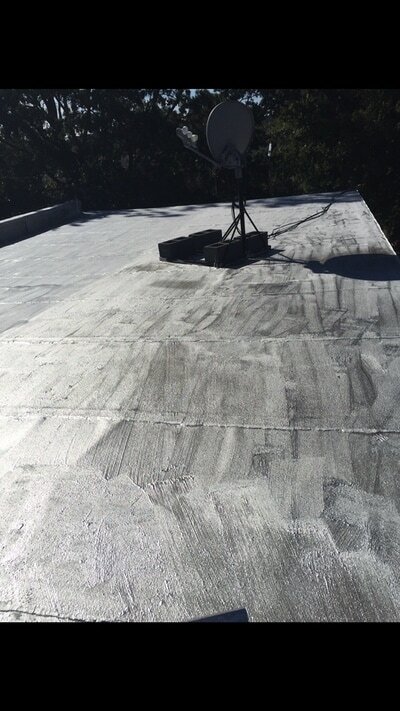 Without special treatments, ballasted and gravel surfaced membranes are not typically acceptable roof surfaces for coating membranes. What types of reflective coatings are available in the market? How is the coating applied? The coating can be applied using spray, roller or brush. A primer is no substitute for thorough cleaning. However, sometimes primers are required, depending on substrate and type of coating. Refer to your coating manufacturer for specific requirements. How much coating should be put on the roof? This depends on the coating manufacturer and the project specifications. When in doubt, consult the coating manufacturer you are working with. How do I prepare the roof surface for coating? Should I coat a new roof or nearly new roof? What are the energy savings? What are the building code requirements for roof coatings? This depends on the local, state, and federal code enforcement requirements that have jurisdiction in your area. The International Code Council (ICC) provides detailed information on the status of I-Code adoption throughout the United States. Will a reflective coating extend the life of my roof? Yes. 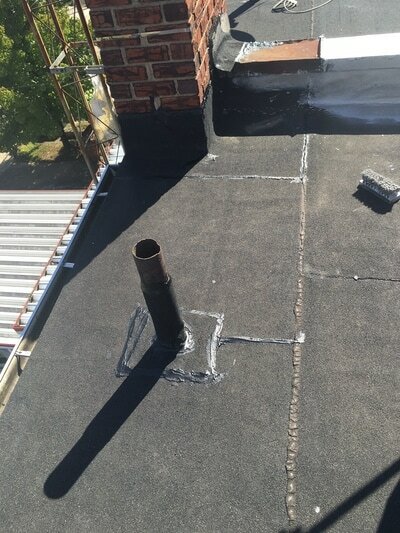 The coating becomes the first layer of UV and waterproofing protection for the roof, and helps reduce expansion and contraction (thermal shock) of the roof. Are there any warranties available? Yes. Coating manufacturers offer different types of warranties depending on your needs and applications. How long will the coating last? Based on long-term histories, typically the roof life of a properly applied roof coating can be extended up to 10 years or more. Performance can vary depending on type and conditions, as well as the coating film thickness. Can the roof be recoated in the future? Yes. As the coating wears away, additional coating can be applied. Most coatings systems are renewable and sustainable. Refer to the specific coating manufacturer you are using for their specific requirements on re-coating applications. Do I need a contractor, or can I do it myself? 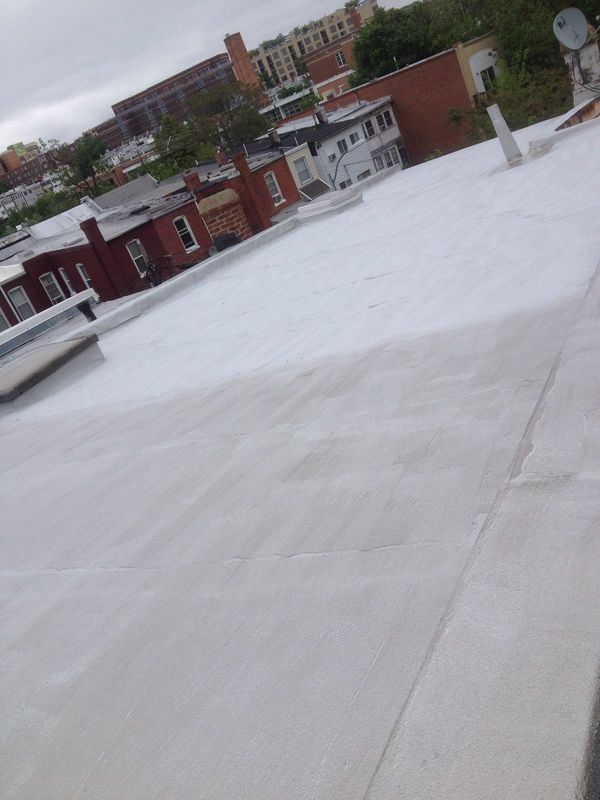 The coating can be applied by an experienced roof coatings applicator. 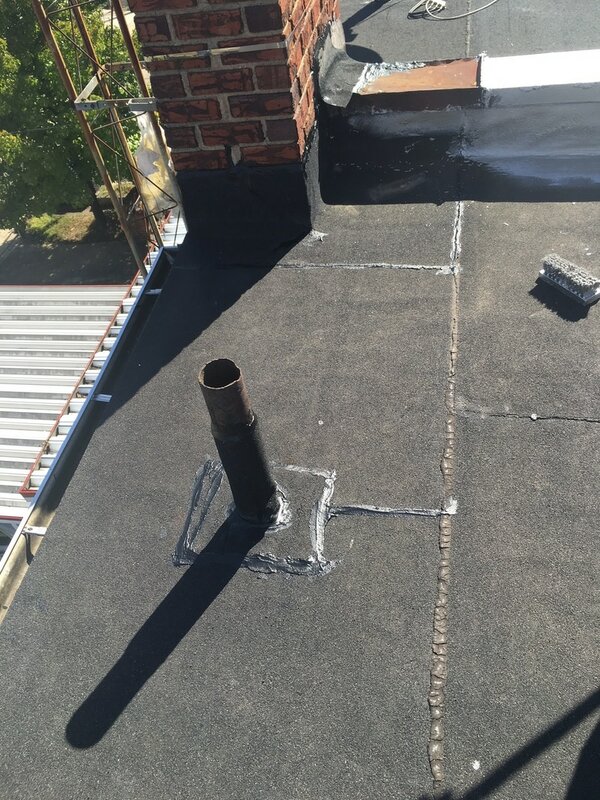 A roofing contractor is strongly recommended if there are such issues as existing leaks, wet insulation, damaged deck, or manufacturers’ warranties. Can a coating stand up in ponding water conditions? That depends on the coating. All roofs should be designed and built to have positive drainage and not allow ponding water. Some coatings are designed to withstand ponding conditions; however, not all coatings will withstand these conditions. Check with your manufacturer to see if your coating can withstand ponding water conditions. In what weather conditions can the coating be applied? For water borne coatings, the ambient air temperature should be 50oF (10oC) and rising, with no rain for the next 24 hours. Solvent borne coatings can be applied in colder weather. As always, check with the coating manufacturer. How long does the coating take to dry/cure? That depends on many factors: air temperature, wind, roof surface temperature, relative humidity (water borne coatings) coating color and the type of coating applied. For example, some coatings are moisture cured and thus humidity assists in its curing process. Can I coat a rusted metal roof? Rusted metal roofs can be coated after the rust conditions have been addressed. If the roof is “white rust” (zinc or aluminum) it can be coated after cleaning. If the roof is “red rust” the rust must be removed or treated with a corrosion inhibiting primer. All rusted fasteners should be treated or replaced. ENERGY STAR is a US Government sponsored program encouraging the use of energy efficient products. Roofing materials including coatings can qualify for ENERGY STAR if the coating meets specific solar reflectance minimum criteria. What is the Cool Roof Rating Council (CRRC)? The Cool Roof Rating Council (CRRC) is an independent, non-profit organization that maintains a third-party rating system for radiative properties of roof surfacing materials. Is there a tax advantage or rebate program available? Roof coatings are typically classified as maintenance, and in many cases can be written off as such in the same calendar year in which the coating application is completed; check with your CFO for specific details on roof maintenance tax deductions. How do I maintain the coating? It is recommended that the roof, including the coating, be inspected semi-annually and after a major storm or high wind “event”. 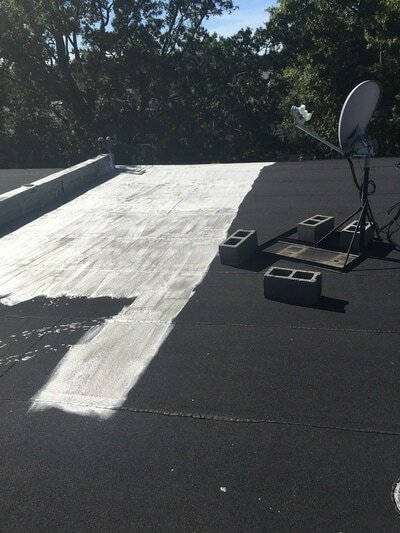 Additional coating may need to be applied to repair damage to the coating and underlying roofing substrate. Check with the manufacturer and/or warranty program requirements. What are Solar Reflectance and Thermal Emittance? Solar Reflectance is a measure of the ability of a material (roof coating) to reflect the sun’s radiation. Thermal Emittance is a measure of the material (roof coating) to release trapped heat back into the atmosphere. Will the coating stop my leaks? Where do I find a contractor to coat my roof? ​Check with the coating manufacturer who may be able to suggest applicators who have used their products and have familiarity with the application. Another option would be to interview contractors and ask specific questions about their proven ability to install roof coatings. 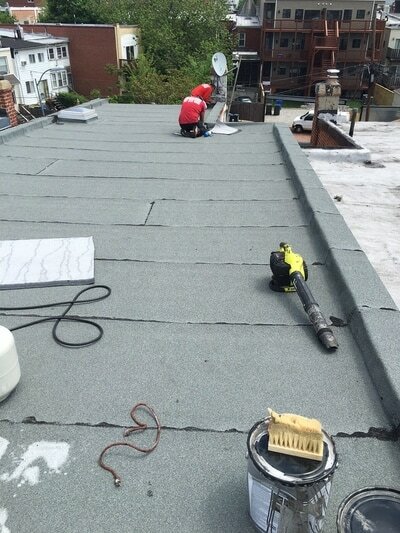 Contractors affiliated with the National Roofing Contractors Association (NRCA) or local roofing contractor trade associations typically are more knowledgeable. Consult those groups’ websites for contractors.